The films of Yasujiro Ozu often defy mere description for me — certainly not because his narratives are complicated or difficult to distill down into several sentences, but because such an act doesn't seem to accurately convey the experience of seeing an Ozu film in the slightest. Late Spring is about a widowed professor, Shukichi Somiya (Chishu Ryu), who worries about his 27-year-old daughter, Noriko (Setsuko Hara), and determines he needs to get her married so she can leave his side. There you have it. Now of course, I can amplify that by mentioning the believable rapport between Chishu's father and Setsuko's daughter, the warm but incisive ways Ozu's compositions reflect on the nature of domestic life and the almost overwhelming emotional poignancy the film achieves with the inevitability of its conclusion. Is that enough? Not even close — if there's any filmmaker who justifies the existence of the term "movie magic," it's Ozu, and Late Spring is a prime example among the dozens of others. The film's wistful, melancholy mood is echoed in its juxtaposition of wide-open natural spaces and the well-ordered confines of home and routine. Ozu allows for the pleasure of carefree, unhindered dreams — as in a gorgeous sequence featuring a bike ride and the expansive sky — but he also recognizes the reality of day-to-day life, the eventuality of loss in the midst of the mundane and the way the world presses on regardless. Late Spring is a masterpiece. One has to marvel at the way Ozu constructs such a highly emotional narrative without it ever tipping over into maudlin or cloying territory. Like all Ozu films, it must be seen to be believed. 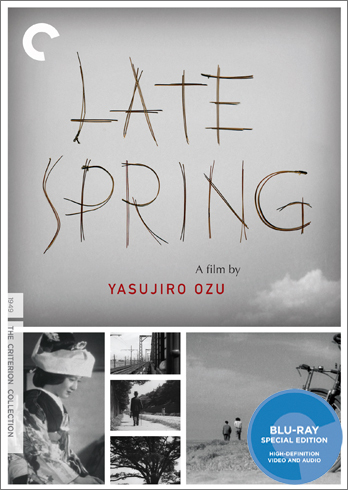 The Criterion Collection grants Late Spring a 1080p high definition transfer in its original 1.33:1 aspect ratio. Like a lot of Ozu films, the film elements aren't in the greatest condition here and they limit the Blu-ray from ever achieving a wholly impressive look. Scratches both small and large afflict the image nearly constantly, but the most egregious damage has certainly been tempered. Flaring from the left hand side also pops in throughout the film, and whites can look a little blown out occasionally. That said, fine detail is certainly a step above SD quality, and image sharpness and clarity is pretty strong beneath the damage. This is a very watchable presentation, with Criterion doing its best to minimize the effects of the damage without harming the filmic integrity. The uncompressed mono audio has some hiss and crackle to it, and louder moments can come off a bit harsh in the mix, but it's generally clean despite being fairly hollow due to the source elements. Criterion ports over the extras from its 2006 DVD release of the film — an audio commentary by Richard Peña, program director of New York's Film Society of Lincoln Center, and Wim Wenders' 1985 documentary, Tokyo-ga, which is part tribute to Ozu, part Chris Marker-style travelogue. The package also includes a booklet with an essay by critic Michael Atkinson, a piece by historian Donald Richie on the relationship between Ozu and Setsuko Hara, and a note by Ozu on screenwriter Kogo Noda. This certainly isn't the most impressive Blu-ray you'll come across from Criterion or elsewhere, but Ozu in 1080p is a cinephile's dream.